Discover your unique female archetype to combat emotional eating, lose weight, and become your happiest, healthiest you. · The Nurturer is always there to care for others. She is kind and compassionate, but this can come at the expense of her own self-care. · The Wonder Woman bases her self-worth on her accomplishments. She is ambitious and driven, but her work often takes precendent over her diet. · The Femme Fatale is sensual, strong, and alluring but can become obsessed with her looks to the point that she develops an unhealthy relationship with food. · The Ethereal is spiritual and intuitive, but highly sensitive to her environment so she tends to eat to numb her reactions to the world. By becoming attuned to your archetype, James shows how you can alter your diet to help feed your unique body chemistry while simultaneously examining how your sense of self-worth shapes your behaviors—including what you eat—in ways that may be working against your goals. 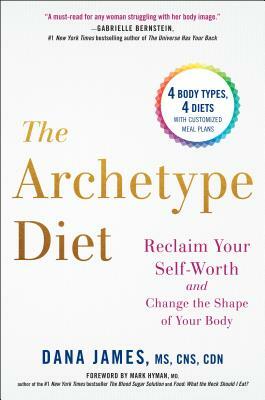 Offering recipes, a ten-day meal plan, and a step-by-step psychological intervention, The Archetype Diet will put you on the path to becoming leaner, stronger, and more attuned to your feminine fire and energy. Dana James, MS, CNS, CDN, received her Masters of Science in Medical Nutrition from Columbia University. She is a board certified nutritionist, functional medicine practitioner and cognitive behavioral therapist. She specializes in weight loss, woman's hormonal health, mood disorders and destigmatizing shame from childhood experiences. She is a trusted nutrition and self-worth expert for media outlets like The New York Times, Elle, Vogue, Harper's Baazar, and MindBodyGreen. She divides her time between New York City and Los Angeles. "Putting self-worth at the center of the weight loss conversation is eye-opening. This book is a must-read for any woman struggling with her body image. Learn how to value yourself and your body through Dana's soulful wisdom and guidance." "Dana James reveals the simple but powerful wisdom of the feminine archetypes. This is a bold, fresh take on inner and outer beauty for women at any age, with an effective diet and lifestyle plan to back it up, and plenty of emotional support as well--a whole program that addresses mind, body, and spirit. Dana guides women on a new path toward self-discovery, helping them to rediscover their inner radiance and rebalance their lives." "Dana James is one of the foremost experts in functional nutrition. I have personally witnessed how she has been able to help transform women's perspectives on food, their bodies and themselves, helping them experience a lasting shift in their weight energy and mood. This is a book every woman should read." "Imagine expressing all of your feminine energy in a balanced way - the compassionate, the sensual, the creative, and the intellectual - all parts of you would be expressed and you would feel whole. If, however, you overly rely on one of them to feel worthy, you quickly get out of balance emotionally, become stressed and lose the ability to prioritize yourself and self care. Dana James wants to help you break this cycle that leaves you stuck in a lifestyle and a body that leaves you drained and frustrated. Her book will help you understand the connection between your personality type, entrenched behavioral patterns, emotional triggers and weight struggles so you can give yourself the support you truly need to make lasting change for sustained weight loss from the most self aware and kind place." “You are your best nutrition guru. The trouble is that many of us need help listening to our bodies. Dana James is a beacon in the fog of confusing and conflicting dietary guidance. She offers women a comprehensive path back to their most radiant selves." - Drew Ramsey, MD psychiatrist and author of Eat Compete and Eat to Beat Depression.